132 m2, 3 bedroom, 2 bathroom country house situated within walking distance to 3 villages close to the Riofrio area of Granada, famous for its delicious trout and caviar! The property is accessed via a very short dirt track of approximatley 0.25 km, it is fully fenced with electric gates and parking for 3 cars. At the front of the house is a raised terrace of 6 m2 under which is the septic tank and a storeroom of 12.8 m2, a hot water boiler, deposit and the water softener. Inside the property comprises a 23 m2 lounge with wood burner and dining area, 13.2 m2 fully fitted kitchen with gas ranger cooker, up the stairs to the upper lounge / den of 13.2 m2 with a door to the 37 m2 rear terrace on 2 levels with awning, water, and electric points, bedroom 1 of 19.8 m2 with fitted wardrobes and ensuite shower room of 3.9 m2. To the opposite side of the lounge you have 2 bedrooms of 11.5 m2 and a 5.9 m2 family bathroom with bath and shower cubicle. Features include grilles, private well, mains water, water softener, deposit, gas hot water, pre plumbed central heated including radiators throughout, persiana blinds, double glazed aluminium windows with a wood finish, space for an above ground pool and fantastic mountain views. Furniture is negotiable. This property has Energy Performance Certificate. 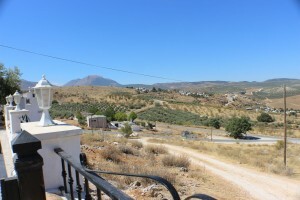 This attractive finca situated in the heart of Andalusia, offering amazing panoramic views in a quiet setting is offered for sale in excellent condition, and would make an ideal holiday home or is also suited to a permanent life in Spain. A beautiful location with local facilities, mains water supply as well as own water supply. Plumbing on the terrace for hot tubs. All fittings and fixtures available. Good bus service in and out of Loja, superb motorway network connections to Malaga, Granada, and Sevilla.